Eight months after its doors officially opened, The Grid is proving that the food hall remains to be a key player in Manila’s dining scene. While its contemporaries are starting to close shop and its tenants are moving on to open their own brick-and-mortar, Rockwell’s own food market and its vendors are churning out fresh offerings nonstop. Stall number 11, home of Bun Appetit’s seafood rolls and Manila’s most venerable garlic noodles, is playing up their offerings with the help of avocados. The lobster roll is made even more luxurious with a heaping mound of creamy avocados. From the bread to the lobster chunks to the green mash, everything is just buttery. 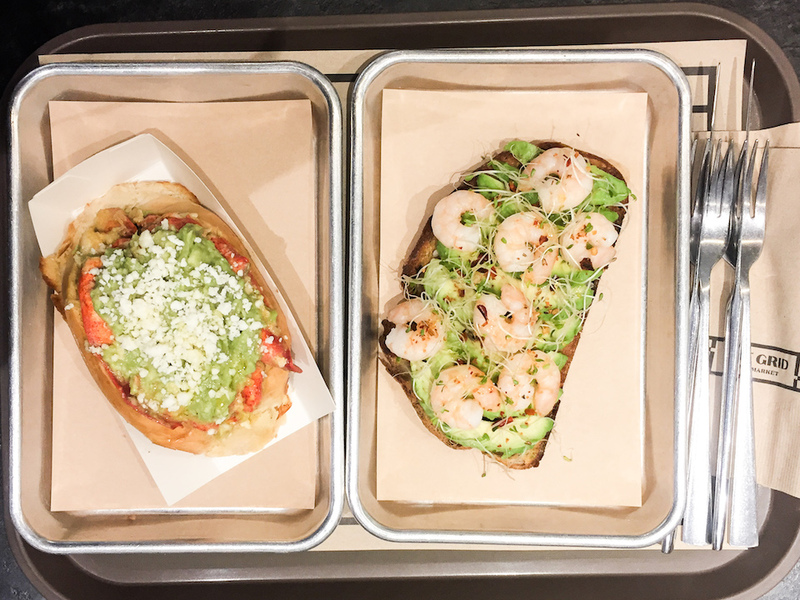 Meanwhile, the avo-toast features crusty bread, smoked avocado slices, sweet and tender shrimp, sprouts, and chili flakes. The creation is a good option for everyone skipping meat all Fridays of Lent. Bun Appetit’s lobster roll is made better with a generous dollop of avocado on top. They also have avocado shrimp toast. Right beside Bun Appetit is another dessert player finally opening in the market. An ode to all things good about Filipino cacao, Risa’s stall purveys chocolate creations done with expert precision. 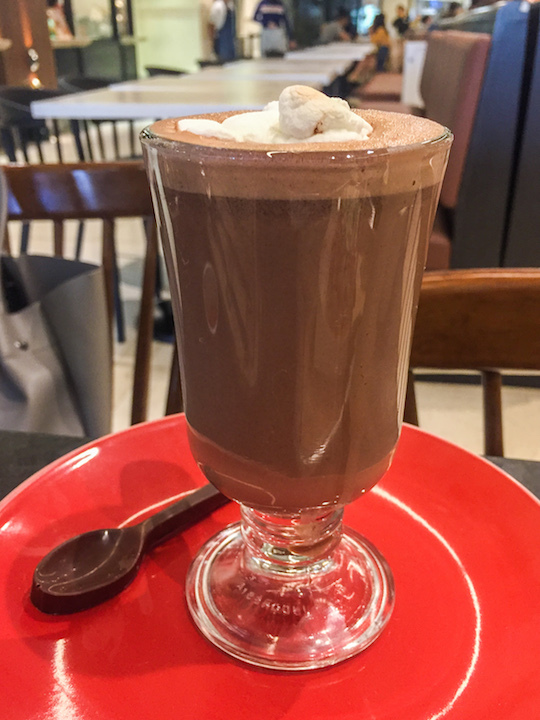 The team has gone through rigorous training under chief chocolatier Pam Cinco just to perfect a cup of hot cocoa with marshmallows or a cool, milky chocolate drink. They’re also coming out with version of a hot chocolate “affogato” and the ubiquitous champorado. Risa’s famed bars, truffles, and other packaged creations are also up for sale. Towards the back end, not to be overlooked is stall number 5, which has finally opened to dish out well crafted Korean comfort food. Taking helm of the kitchen is wunderkind chef Patrick Go. Korean barbeque can now be enjoyed sans the need to grill your own food. The set is complete with the usual accoutrements, plus a few small plates of flavorful banchan. 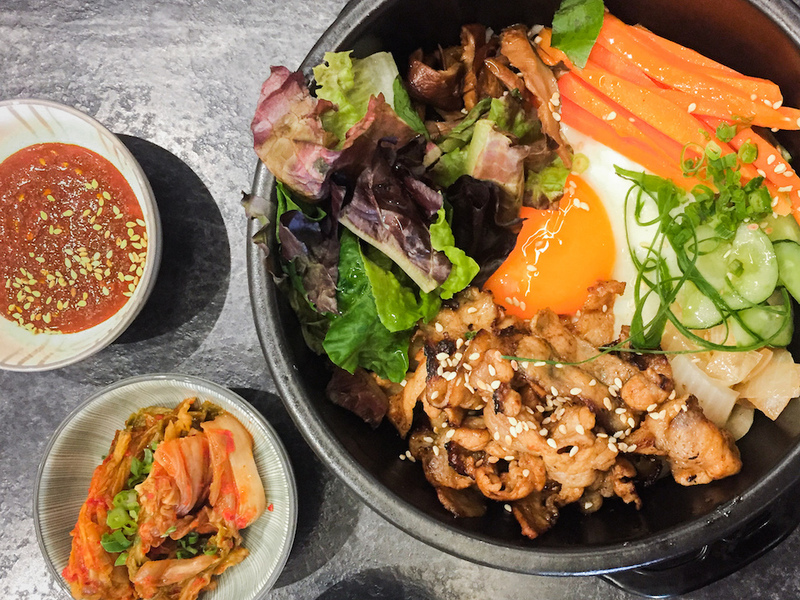 Even more rewarding is the bibimbap, which can come with beef ribeye, pork belly slices, or tuna bulgogi as its star. Soon, the stall will also offer other Korean favorites like spicy noodles and chapchae. A couple of other stalls also recently opened including The Beef, peddling affordable smash burgers. There’s the 250-peso crusty beef patty in a potato bun with special sauce. An additional P40 makes it a cheeseburger. Beside it is a stall purveying Asian comfort food, including a fantastic laksa, crafted by chef Him Uy de Baron. Soon, The Grid will also be expanding to add more seats and a handful of stalls, helmed by more of Manila’s esteemed chefs. Other existing stalls are also churning out more options. Weekday lunch specials have been started by Bucky’s, Tsuke-men, and Rambla. Meanwhile, Workshop doesn’t just do sweets and pastries anymore. They’ve expanded their repertoire to offer sweet and savory French-style crepes. Up for some dark chocolate strawberry or a sausage crepe, maybe? Playing favorites at The Grid just got even more difficult.